Hippie clothes. Bohemian clothing. Artsy clothing for expressive women! Classic gypsy hippie chick bohemian shabby chic styles for creative women. Handmade boutique styles at affordable prices. 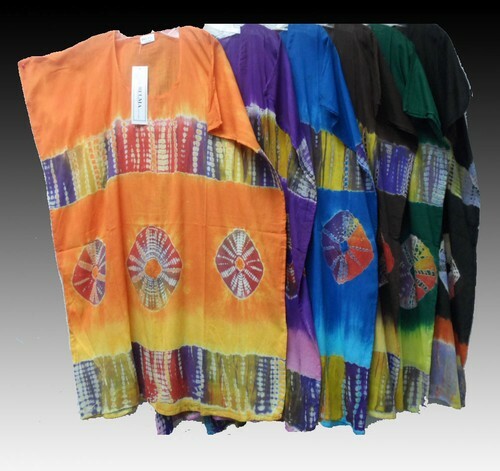 100% Cotton ethnic tribal gypsy Tie dye peasant caftan big top. Traditional Indian shape and design. Comfortable lightweight fabric is perfect for the beach as a cover-up or a lounger for those hot summer days. Very Figure-flattering with an excellent drape to the fabric. This caftan top would look great with leggings, harem pants, or a skirt. Because of the handmade nature of these garments, sizing varies. The measurements here represent an average measure of this garment. Bust measurements are taken with the garment stretched. Check the measurements below. The material is rather thin but is exactly what I need for this summer as I cannot take the heat I plan on getting the rest of them and all the files!